This set features three Mediterranean inspired, white-washed ivory wax pillar candles, each with a warm glow and natural flicker. Arrange among your favorite trinkets on a coffee or console table for a touch of inviting ambiance. 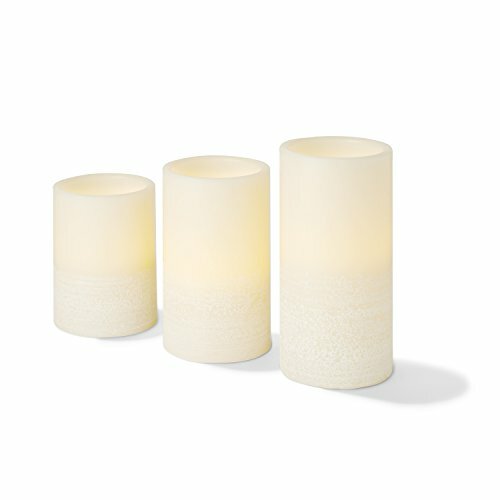 VERSATILE ✓ - Features a set of three ivory smooth pillar candles with a textured white base. This candle set is a great housewarming or holiday gift, party decoration, or wedding centerpiece. Versatile and unique this candle set is made to impress! REMOTE INCLUDED ✓ - This candle set includes an 8-function remote for a preference-tailored experience. Functions: ON/OFF, 4Hr/8Hr Timer, Steady On/Natural Glow, Bright/Dim. REALISTIC ✓ - These candles emit a warm white natural flicker which helps create a genuine look and overall ambient, cozy feel. This candle set is a great alternative to traditional candles and is great for decorating tables or mantles without the worry of messy drippings. VARIETY PACK - DIMENSIONS ✓ - This set includes one 4"H, 5"H and 6"H candle. All candles have a 3"D.
CUSTOMER SATISFACTION GUARANTEED ✓ - LampLust is looking for your absolute satisfaction. Our USA based support team can be reached through seller messages or by phone. This product has a 90 day replacement warranty.